What’s the perfect read for fans of New York Times bestselling mystery authors Lilian Jackson Braun and Rita Mae Brown? 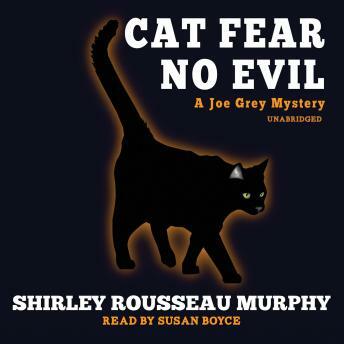 This delightful ninth Joe Grey Mystery from award–winning author Shirley Rousseau Murphy. Evil has crept into Molena Point, California, on stealthy cat feet. A rash of brazen burglaries, from antique jewelry to vintage cars, coincides with the unwelcome appearance of yellow-eyed Azrael, feline nemesis of crime-solving cats Joe Grey and Dulcie. But what follows soon after really has Joe’s fur standing on edge. A young, healthy waiter drops dead at a reception for local artist Charlie Harper. And when the trail of big-time thefts leads up to San Francisco, the dark beast Azrael is on the scene. Does he have contact with a stalker and a handsome philanderer? If Joe and Dulcie don’t get to the bottom of these misdeeds soon, they and all their human friends will have ample reasons to be afraid—very afraid. It’s time for the feline sleuths to start sniffing out the truth.